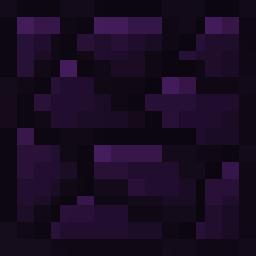 Obsidian is a material found naturally in [[the Nether]] and in [[the End]] or created in the [[the Overworld]] when a [[water]] flux makes contact with a [[lava]] source block. Obsidian can only be mined with a [[Pickaxes|diamond pickaxe]] and is the toughest ''mineable'' block. This block resist explosions. [[Nethereye]]s, when killed, may drop obsidian. When mined with a [[Pickaxes|diamond pickaxe]], obsidian drops itself. Obsidian is created when a [[lava]] source block makes contact with [[water]]. Obsidian is also created from both flowing lava and source blocks as a result of [[rain]] and [[Event:Snow|snow]]. [[Nethereye]]s, when killed, may drop obsidian. Obsidian can be used for build explosion-resistant structures and different crafting recipes. * Obsidian is the second most resistant block in Mine Blocks(in the first place is the [[bedrock]]). * The design of the obsidian has been updated in the update 1.27.